It is so tempting to lower our inhibitions when relaxing among family and friends while in front of a feast on display at the picnic table. Unfortunately, calories eaten outdoors still count! So go ahead and enjoy while keeping quantities in check. One meat protein serving (i.e. chicken, fish, or beef) is about three ounces. Keep side dishes to about a half cup and no more than a cup depending on the item. Make second helpings about fruits and vegetables. Check out the spread before you fill your plate. Decide what you really want to savor. The more variety on your plate, the more you will eat. That’s because food variety stimulates the appetite. So be choosy with your calories and limit the items on your plate. Look at all the foods available on the buffet to choose the ones that are worth eating before diving in. Don’t waste calories on foods you don’t enjoy or that are always available to you. For instance, skip the chips, and get in line at the grill! Start with low calorie foods first, such as filling up with fruits and vegetables. Starting with a salad is a simple way to get in nutrition and keep you from overeating. Opt for olive oil and vinegar over creamy dressings. Cut out the extras and appetizers so that you can indulge in your favorites without racking up the calories. While some forgo the bun on a burger with the false belief carbs are all bad, we really need to pay more attention to meat portions, types, and preparations methods. A whole grain bun, for example, provides 160 calories, 1/2 gram saturated fat, 3 grams fiber, and 5 grams protein and pairs perfectly with a 3 ounce cooked patty of regular (30%) ground beef containing 230 calories and 6 grams of saturated fat. In reality, this true portion is rarely what we serve up for ourselves at a BBQ. The common portion of a half-pound patty contains approximately over 600 calories and 16 grams of saturated fat, and that is without any toppings, condiments, or bread. To provide satiety and enjoyment, you are much better off eating a meal that combines a carbohydrate and protein, i.e. hamburger with the bun. Marinades. Cooking and marinating herbs and spices, including turmeric, cinnamon, cloves, oregano, allspice, ginger, and garlic can also inhibit AGE formation. My go to’s are lemon juice, oregano, and extra virgin olive oil as my primary marinade and use it on everything mitigate the production of AGE. Precook. Place meat, fish, or poultry in the microwave to cook prior to grilling to substantially reduce AGE formation by reducing the time the protein is exposed to high heat. Flip it. Continuously turn the meat over on a high heat source instead of leaving it on the grill without flipping often. Flipping every minute or so can cut AGEs by 75 to 95%. Remove charred portions of meat and refrain from using gravy made from meat drippings can also reduce HCA and PAH levels. Trim off excess fat from the meat, poultry, and fish before grilling. Avoid overcooking. Using small pieces of meat on a skewer and rare to medium steaks have fewer AGEs than well-done. Wrapping foods in foil is a great way to keep foods safer on the grill because you are creating a moist cooking method. You can do this with all kinds of protein, vegetables, and fruit. Add a plant. Make sure you add some fruits and vegetables to your meal. Plants like cruciferous vegetables, think broccoli, can help the liver detoxify and remove certain chemicals (examples: heterocyclic amines or HCAs and polycyclic aromatic hydrocarbons or PAHs) can be removed from the body. A plant-based diet can decrease the extent of DNA damage and oxidation from these compounds. Lastly, there are an array of awesome tasting vegetarian or vegan meat-alternatives to experiment with to help you limit your intake and frequency of not only meat in general, but also processed (i.e. hot dogs) or smoked meats that also increase the risk of certain cancers. Keep in mind that most processed meats are high in saturated fat and sodium, which we all should limit for good health. Always balance your meals with a carbohydrate, protein, and healthy fat for greater satiety and nutrient density. 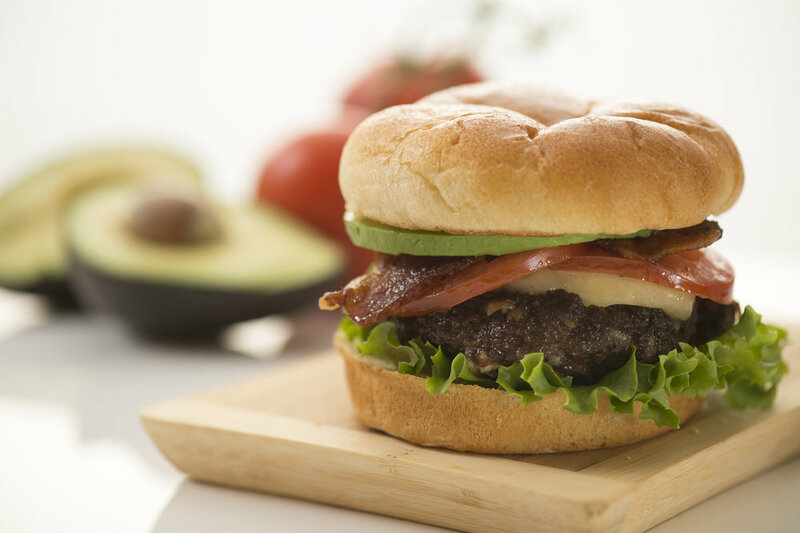 If you are craving a grilled hamburger on a soft potato bun, go for it while keeping the balance in mind. If there is a whole grain bun option, you can get in some extra fiber as part of your meal. Again, the idea is to keep portions in check and even out nutrient distribution. If you have that special treat you desire, so what, it’s one meal, get back on track the next meal. Also remember, the outdoors provide countless ways to be physical active and burn off some of those extra calories so make the most of the warmer season. Bottom line: Eat the bun, skip the double stacked burger. Keep the balance. A plant based varied diet has many health benefits including: reduced frailty in aging, longevity, a reduction in chronic disease including cardiovascular disease, type 2 diabetes, obesity, metabolic syndrome, certain cancers, and cognitive impairment. Aunt Millie's Buns are the Best!